Mass incarceration and the challenges faced by people reintegrating after incarceration have profound effects on the wellbeing, inclusiveness, and sustainability of communities across the United States. The exponential expansion of the criminal justice system, its concentration in low-income communities of color, and the social stigma and legal exclusion that accompany it have made it one of the defining issues of this era. Through our partnerships with community-based organizations, the Pacific Institute has found that our participatory research processes and community capacity building have a powerful effect when adapted to work on these issues. The Safe Return Project is a participatory action research process in Richmond, California, involving formerly incarcerated residents in carrying out research and organizing to increase opportunities for community reintegration. 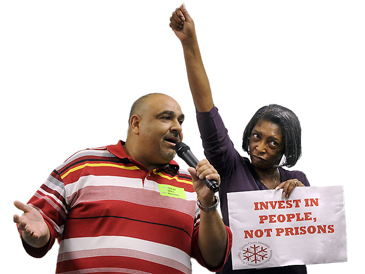 Launched in 2010 through a partnership between with Contra Costa Interfaith Supporting Community Organization and the Richmond Office of Neighborhood Safety, the project is one of the first in which formerly incarcerated residents lead an in-depth research process to develop analysis and leadership capacity to advocate for systems change to reduce recidivism and support community reintegration. Safe Return research has included an extensive survey of the experiences and perspectives of recently released Richmond residents, case studies of reentry service providers, a survey of Contra Costa County service providers, policy research on employment and housing policies related to reentry, and analysis of the county’s implementation of AB109 realignment legislation. Among many other findings, the project found that more than half of the people coming home to Richmond did not benefit from a single training or support program while they were incarcerated. Seven out of ten individuals did not have a stable living situation three months after their release. An astounding 78% of the formerly incarcerated residents were unemployed, four times the rate of unemployment for Richmond as a whole, and seven times the rate for California. The Safe Return Project was central to the City of Richmond changing its hiring process to level the playing field for formerly incarcerated applicants. The project was also integral to Contra Costa County withdrawing a proposed jail expansion and dedicating over $5 million to transitional housing, employment, integrated services and bail reform. As of fall 2014, the Community Strategies for Sustainability and Justice Program closed. The Safe Return Project, which was housed under this program, is no longer active. For more information on the closure of this program click here.